Park Avenue Grooming is giving its ‘alpha male’ fans on Facebook a chance to get into the cockpit of the world’s fastest Street Legal Car – The Ariel Atom. It’s the season for speed in India with the Indian GP just a week away and this is a great association to leverage for Park Avenue. 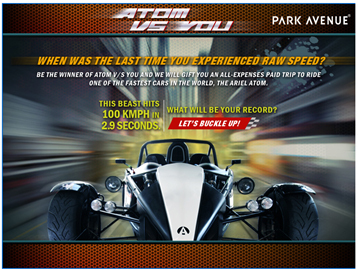 Atom Vs You Contest is a Facebook Game Application where you need to hit the space bar to accelerate the Atom from 0-100kmph. In reality the Atom hits 100kmph in 2.9 seconds. The game doesn’t work for me, the clock keeps ticking, the car hardly moves and you keep jabbing the space bar. I feel there should be a time cap for clumsy gamers (like me) so they get to try again or see some communication instead of just trying to figure out how to exit the game. So I guess there is hard work in store for the winner who needs to reach 100kmph in a game thats got nothing to do with adrenaline or raw speed, and then post a message around why he thinks he deserves the ride. I liked the creative rendition but the game itself and the flow seem lacking.